Tuesday August 16th 1881. I was busy about the house-work most of the forenoon. Bridget got home early this morning. Mother had been over to Hatts all night. I sewed a little in the afternoon and took another music lesson. Mother went back over to town. Wildes folks went east tonight Wednesday August 17th 1881 I helped with the work practiced some and sewed in the afternoon. Mother was home awhile today. Weather warm. I do not feel very well. 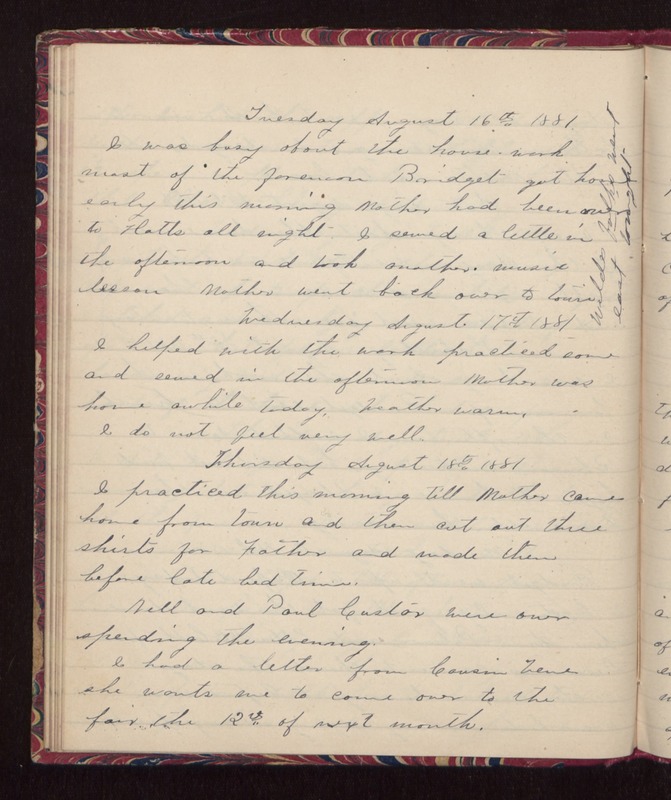 Thursday August 18th 1881 I practiced this morning till Mother came home from town and then cut out three shirts for Father and made them before late bed time. Nell and Paul Custor were over spending the evening. I had a letter from Cousin Vene she wants me to come over to the fair the 12th of next month.